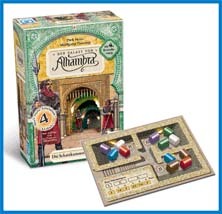 The fourth Expansion to "Alhambra"
This is an amazing set of 4 mini-expansions that all add great changes to the base game. I am particularly thrilled about the Invaders, since they make the walls of the Alhambra have a purpose rather than just being a restriction on building. I also really like the Treasure Chamber and might even buy a second set of this expansion just for the amazing treasure chest pieces.